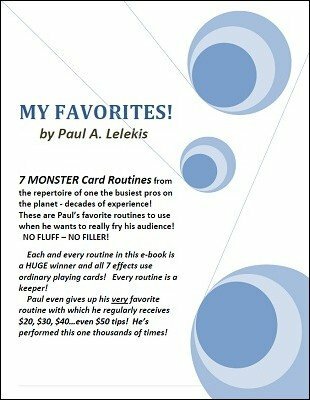 Long-time professional magician, Paul A. Lelekis, has finally released his pet, "go-to" routines that he has used in actual performance hundreds...even thousands of times over the years in many shows and table-hopping in restaurants for decades! All of these routines are true "real-world workers" that will smack your spectators' right between the eyes. The day before Paul finished writing this e-book, he performed at a large corporate function of about 50 employees and their children at a park and he used all seven of the routines in this tome...and in some cases, several times each. The show was so successful that he received dozens and dozens of e-mails and FaceBook messages from these same people last night and today, telling him how much they enjoyed his performances. There are few people with more experience than Paul when it comes to table-hopping. Paul has performed these very routines, thousands of times while table-hopping in many restaurants, for decades. All of these effects use only a regular deck of cards - NO GAFFS! Buy this e-book and learn this material! Paul knows magic! 1) Dream Card II is Paul's favorite effect of all time. This winner will stun your audience with hilarious patter and an absolutely IMPOSSIBLE outcome! Paul makes HUGE tips from this one effect...he even received a $48 tip from the worst heckler that he's ever had! The finale blows EVERYONE away. It's just NOT possible! 2) Thought-of Triumph + will have to be "played" to be believed. This will require some fortitude, but if you stick with it, your spectators will "freak out". J.K. Hartman said that, "...I've never seen any effect like this one before! Unbelievable!" 3) Twisted Transposition is an impossible transposition of the Aces and Jacks. Paul has had some magicians who saw this effect ask him if he used gaffs. No way! 4) Spectator Cuts the Aces X2 - A fantastic effect where the spectator cuts to the Aces not once - but TWICE! Both times the spectators are completely floored. 5) Twisting the Jacks - Paul has combined his own, easy-to-do handlings, with Vernon's "Twisting the Aces" and Jennings "Pineapple Twist" for a knock-out 3 stage routine that will have your spectators trying to check you for "gaffs". There are none! 6) Reflective - What a powerhouse routine this one is. This beautiful multi-stage piece of theater that will leave your spectators with their mouths wide open! For the finale, the spectator shuffles the deck and yet the performer shows that every single card in the deck, now, is paired up by their mates. AMAZING!! BONUS ROUTINE! This fantastic (and easy to do!) effect is the routine that Burton S. Sperber used to gain membership at The Magic Castle! EXTRA BONUS! Paul teaches the inside scoop about how to make your Faro Shuffles easy to do as well the further scoop on Paul's infamous underground sleight...The Simplex Bottom Reversal. Make your card magic memorable! All of Paul's superb patter is included for these wonderful effects! 1st edition 2013, 35 pages. There are lots of kids publishing lots of card effects. But if you want quality effects by a true professional, then look no further than Mr. Lelekis! This man earns his Buckolas' by performing and creating TOP QUALITY material. The sort of material that will leave your audience's jaws all agog! This book is no different, his version of the Dream Card is literally the very best card effect I have ever learned / read. Top notch thinking with a truly amazing climax. This guy knows his onions, there's no silly hype which proves to be hot air. These are effects to get excited about. If you haven't already indulged in any of his works, now is a great time to start, and I guarantee that you won't be disappointed. At the end of the day, if you want to perform truly outstanding effects that WILL please your spectators, then learn from the man that does this day in, day out. Yes, I am a fan, but why wouldn't I be. This is true working material. Two words 'BUY NOW'. A friend of mine burned me badly with 'Dream Card' and pointed me to Paul's eBook. Paul puts his own spin on some of these classic effects and what you have is a brilliant collection of working card routines. He's obviously worked these for years demonstrated by all the little nuances and tips he drops in here and there. Paul's crediting is full and to be applauded. You could spend $30 on a DVD and be lucky if you end up with one working effect. For $10 I guarantee you'll get at least 3 or 4 workers to add to your repertoire. To be honest if I had paid $20 for this I'd still consider it a bargain. I bought Paul's book just the other day and man was I impressed. I am so looking forward to performing his Dream Card II. This is a real world worker for the close-up entertainer. If the other items in this book are even one-tenth as good as Dream Card II then this booklet will become a classic I'm sure. Thanks Paul for sharing these routines with the community.